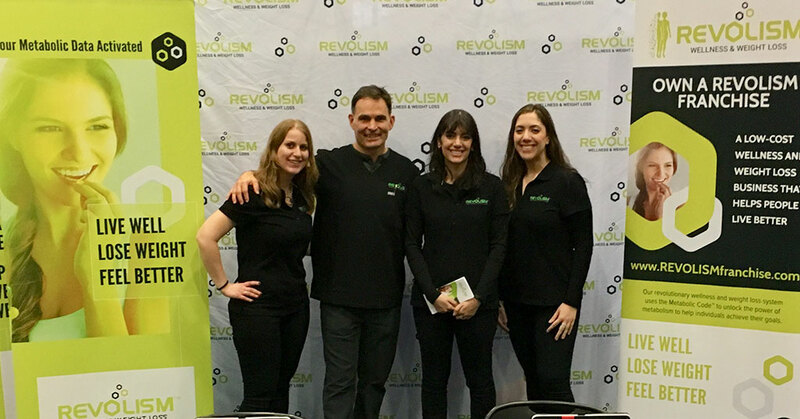 REVOLISM Wellness & Weight Loss has launched consumer delivery of its revolutionary approach to healthy living as the brand hits the road to expand nationwide through franchising. REVOLISM founder David Ramadan and Dr. Benjamin Gonzales, chief medical officer, shared plans for consumer sales and national franchise growth at the recent NBC4 Health & Fitness Expo in Washington D.C. The wellness and weight loss system, founded on more than 30 years of scientific data and research, is now available to consumers directly from REVOLISM’s corporate home in Chantilly, Virginia and through franchisees as the emerging brand expands. REVOLISM, the exclusive franchisor of the Metabolic Code, unlocks the power of the metabolism to help clients achieve wellness and weight loss goals with a program, previously only available through doctors. Ramadan projects the game-changing wellness brand will be home to 500 franchises within five years. REVOLISM brings decades of clinical success to people in their homes, at work, and on the go, and combines this expertise with an exclusive, proprietary line of high quality, all-natural supplements and nutritional products customized for each individual, says Ramadan, who took Curves for Women internationally to several countries in the Middle East and India. “Hundreds of physicians, dietitians, and nutritionists across the country rely on the Metabolic Code, a wellness assessment algorithm, to determine and monitor their clients’ well-being,” Ramadan says. REVOLISM’s success lies in its reliance on the Metabolic Code and the customized supplements created to address the deficiencies the code reveals. REVOLISM is all about the individual approach. Each program, delivered by the brand’s George Washington University School of Medicine & Health Sciences certified wellness coaches, is designed to improve metabolism, based on the specific needs of the individual client. The Metabolic Code assessment combines a comprehensive health history and lifestyle analysis, with in-depth laboratory work (saliva and urine), and biometrics to create a complete wellness report. The user-friendly assessment, which includes dozens of factors, reveals the functions, processes, and body chemistry that need attention and highlights others that are working optimally. Based on the findings, REVOLISM delivers a diet and exercise plan, and custom supplements to create an affordable, sustainable program, designed by the experts at Metabolic Code to exclusively address the client’s wellness, whether the goal is to reduce stress, increase energy, or lose weight. Supplements arrive automatically each month, while a mobile app tracks progress along the way. REVOLISM’s automated platform makes the wellness and weight loss system affordable to both the consumer and the franchisee. Customers pay just $99 for an initial wellness assessment, with individualized monthly programs ranging from $99 to $299, including customized supplements, diet, and exercise plans. For franchisees, REVOLISM is a winning investment, with unlimited promise. The brand bridges the gap between science and technology to deliver a comprehensive state-of-the-art wellness and weight loss solution that is the perfect franchise fit, says Ramadan. To find a wellness coach or learn how REVOLISM can increase vitality at every stage of life, visit www.REVOLISM.COM or call 1-800-555-7386. For REVOLISM Wellness & Weight Loss franchise information, head to www.REVOLISMfranchise.com.